Caption: Evening on the Lagoon. Size: 14 1/4 x 8 1/2 in. 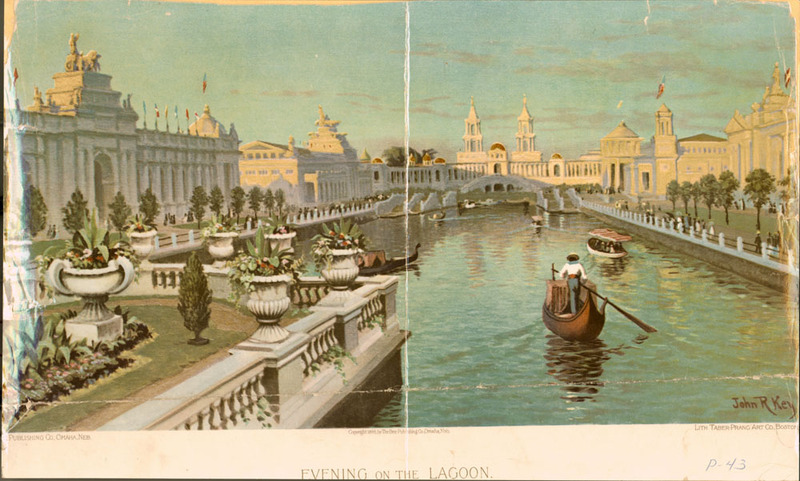 Lithograph of Grand Court lagoon, looking east. Balustrated Island in foreground, gondolas in water, and Manufactures, Machinery & Electricity Buildings to the Northeast; Twin Tower Restaurants and grand colonnade to the east; and Mines & Mining and Liberal Arts Buildings to the southeast. Light crowd surrounding lagoon. The Bee Publishing Co., Omaha, Neb. 1 sheet previously folded in quarters. Poster.